Director of the National Intelligence James Clapper participates in the Senate Intelligence Committee's hearing on worldwide threats, Feb. 9, 2016, on Capitol Hill in Washington. The latest U.S. intelligence assessment is skeptical about prospects for political reconciliation in war-torn Afghanistan and has warned it is at "serious risk of a political breakdown during 2016." U.S. National Intelligence Director James Clapper told a Senate committee Tuesday the Kabul government faces persistent hurdles to political stability, including eroding political cohesion, assertions of authority by local powerbrokers, financial shortfalls, and countrywide, sustained attacks by the Taliban. Clapper said the Afghan government will confront larger and more divisive issues later in 2016, including the implementation of election reforms and long-delayed parliamentary elections. Afghanistan's Foreign Minister Salahuddin Rabbani, center, speaks during a one-day meeting with Pakistan, U.S. and Chinese delegations in Kabul, Jan. 18, 2016. The talks are aimed at ending the country's 15 years of war with the Taliban. The assessment comes as Afghan President Ashraf Ghani’s national unity government is expected to hold direct peace talks with the Taliban by the end of February to seek an end to a 15-year insurgency. 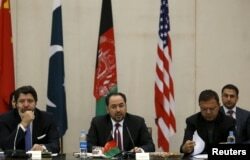 Senior diplomats from Afghanistan, Pakistan, China and the United States agreed last week in Islamabad on a “road map” to further the peace efforts and vowed to arrange the negations. But the Taliban has not indicated whether it wants to join the peace process and has instead reiterated its demand for the complete withdrawal of U.S.-led foreign forces from Afghanistan before any peace talks. Clapper told the Senate committee he thinks the Taliban position has consistently been not to negotiate. "The pre-condition they always describe is the removal of foreign forces (from Afghanistan) and I do not see them changing that position,” he said. Clapper’s assessment also suggested that after initial infighting over a leadership succession, the Taliban has again become a united force under its new leader Mullah Akthar Mansour, who took charge in July when it was disclosed that longtime Taliban leader, Mullah Omar, had been dead for more than two years. He added, the Taliban’s two-week seizure of the northern provincial capital Kunduz provided an important boost to Mansour’s leadership. “We assess that fighting in 2016 will be more intense than 2015, continuing a decade-long trend of deteriorating security that will compound these challenges,” he said. “Kabul will be unable to effectively address its dire economic situation or begin to curb its dependence on foreign aid until it first contains the insurgency, which is steadily chipping away at Afghanistan’s security,” he said. FILE - Zafar Hashemi, a spokesman for Afghan President Ashraf Ghani, speaks during a press conference in Kabul, Afghanistan, July 29, 2015. A presidential spokesman in Kabul, Sayed Zafar Hashemi, has downplayed Clapper’s remarks about a possible political breakdown in Afghanistan. But Afghan and independent foreign observers acknowledge political differences have prevented President Ghani and Chief Executive Abdullah Abdullah from establishing an effective working relationship to promote good governance in the country where nepotism and corruption critics say are order of the day. 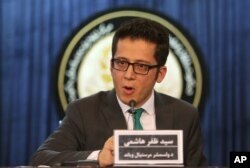 Despite public pledges, Ghani and Abdullah have made little progress towards reforming the national electoral process to discourage the repeat of the disputed 2014 presidential election. They both claimed victory in the polls and the controversy plunged Afghanistan into months of political uncertainty until the United States intervened and mediated a political deal between the two, allowing Ghani to take charge as the president and his election rival Abdullah to occupy a newly created post of chief executive.